e advances made by so-called "Obamacare"
determined by one's economic status? with it untold and unnecessary human suffering. Decreasing the number of uninsured is a key goal of the Affordable Care Act (ACA), which extends Medicaid coverage to many low-income individuals in states that have expanded and provides Marketplace subsidies for individuals below 400% of poverty. The ACA’s major coverage provisions went into effect in January 2014 and have led to significant coverage gains. As of the end of 2015, the number of uninsured nonelderly Americans stood at 28.5 million, a decrease of nearly 13 million since 2013. This fact sheet describes how coverage has changed under the ACA, examines the characteristics of the uninsured population, and summarizes the access and financial implications of not having coverage. How has the number of uninsured changed under the ACA? In the past, gaps in the public insurance system and lack of access to affordable private coverage left millions without health insurance. Beginning in 2014, the ACA expanded coverage to millions of previously uninsured people through the expansion of Medicaid and the establishment of Health Insurance Marketplaces. Data show substantial gains in public and private insurance coverage and historic decreases in uninsured rates in the first and second years of ACA coverage. Coverage gains were particularly large among low-income people living in states that expanded Medicaid. Still, millions of people—28.5 million in 2015— remain without coverage. Why do people remain uninsured? Even under the ACA, many uninsured people cite the high cost of insurance as the main reason they lack coverage. In 2015, 46% of uninsured adults said that they tried to get coverage but did not because it was too expensive. Many people do not have access to coverage through a job, and some people, particularly poor adults in states that did not expand Medicaid, remain ineligible for financial assistance for coverage. Some people who are eligible for financial assistance under the ACA may not know they can get help, and others may still find the cost of coverage prohibitive. In addition, undocumented immigrants are ineligible for Medicaid or Marketplace coverage. Most uninsured people are in low-income families and have at least one worker in the family. Reflecting the more limited availability of public coverage in some states, adults are more likely to be uninsured than children. People of color are at higher risk of being uninsured than non-Hispanic Whites. How does the lack of insurance affect access to health care? People without insurance coverage have worse access to care than people who are insured. One in five uninsured adults in 2015 (20%) went without needed medical care due to cost. Studies repeatedly demonstrate that the uninsured are less likely than those with insurance to receive preventive care and services for major health conditions and chronic diseases. What are the financial implications of lack of coverage? The uninsured often face unaffordable medical bills when they do seek care. In 2015, over half of uninsured people (53%) said that they or someone in their household had problems paying medical bills in the past 12 months. These bills can quickly translate into medical debt since most of the uninsured have low or moderate incomes and have little, if any, savings. In the past, gaps in the public insurance system and lack of access to affordable private coverage left millions without health insurance, and the number of uninsured Americans grew over time, particularly during periods of economic downturns. By 2013, more than 41 million people lacked coverage. Under the ACA, as of 2014, Medicaid coverage has been expanded to nearly all adults with incomes at or below 138% of poverty in states that have expanded, and tax credits are available for people who purchase coverage through a Health Insurance Marketplace. Millions of people have enrolled in these new coverage options, and the uninsured rate has dropped to a historic low. Coverage gains were particularly large among low-income people living in states that expanded Medicaid. Still, millions of people—28.5 million in 2015—remain without coverage. · The share of the nonelderly population that lacked insurance coverage hovered around 16% between 1995 and 2007, then peaked during the ensuing economic recession (Figure 1). As early provisions of the ACA went into effect in 2010, and as the economy improved, the uninsured rate began to drop. With the implementation of the major ACA coverage provisions in 2014, the uninsured rate dropped dramatically and continued to fall in 2015. In 2015, the nonelderly uninsured rate was 10.5%, the lowest rate in decades. · Coverage gains from 2013 to 2015 were particularly large among groups targeted by the ACA, including adults and poor and low-income individuals. The uninsured rate among nonelderly adults dropped from 20.4% in 2013 to 12.8% in 2015, representing a 7.6 percentage point drop, or a 37% decline. In addition, between 2013 and 2015, the uninsured rate declined by more than 10 percentage points for poor and near-poor nonelderly individuals (Figure 2). People of color, who had higher uninsured rates than non-Hispanic Whites prior to 2014, had larger coverage gains than non-Hispanic Whites. Though uninsured rates dropped across all states, they dropped more in states that chose to expand Medicaid (Figure 2). (See Appendix A for state-by-state data on changes in the uninsured rate). Most of the nonelderly in the United States obtain health insurance through an employer, but not all workers are offered employer-sponsored coverage or, if offered, can afford their share of the premiums. Medicaid covers many low-income individuals, and financial assistance for Marketplace coverage is available for many moderate-income people. However, Medicaid eligibility for adults remains limited in some states, and few people can afford to purchase coverage without financial assistance. Some people who are eligible for coverage under the ACA may not know they can get help, and others may still find the cost of coverage prohibitive. · Cost still poses a major barrier to coverage for the uninsured. In 2015, 46% of uninsured adults said that the primary reason they were uninsured was because it was too expensive, making it the most common reason cited for being uninsured (Figure 3).3 Though financial assistance is available to many of the remaining uninsured under the ACA,4 not everyone who is uninsured is eligible for free or subsidized coverage. · Some individuals may remain uninsured because they are not aware of coverage options or face barriers to enrollment, even though they may be eligible for financial assistance under the ACA. In 2015, about one in five uninsured nonelderly adults said they remained uninsured because they didn’t know about the requirement to have health insurance (7%) or didn’t think the requirement applied to them (13%) (some in fact may be exempt under specific provisions of the law) (Figure 3). About one in ten said they tried to get coverage but were unable (11%),5 though under the ACA, insurers may no longer deny coverage to applicants based on pre-existing medical conditions or health status, and many enrollment barriers that appeared in the first year of ACA coverage have been addressed. · Undocumented immigrants are ineligible for Medicaid and may not purchase Marketplace coverage.12 While lawfully-present immigrants under 400% FPL are eligible for Marketplace tax credits, only those who have passed a five-year waiting period after receiving qualified immigration status can qualify for Medicaid. Most remaining uninsured people are in working families, and most are in families with low incomes.13Reflecting income and the availability of public coverage, people who live in the South or West are more likely to be uninsured. Most who remain uninsured have been without coverage for long periods of time. · In 2015, nearly three quarters of the uninsured (74%) had at least one full-time worker in their family, and an additional 11% had a part-time worker in their family (Figure 4). · Individuals below poverty are at the highest risk of being uninsured (the poverty level for a family of three was $19,078 in 2015). In total, over eight in ten of the uninsured are in low- or moderate-income families, meaning they have incomes below 400% of poverty (Figure 4). · Uninsured rates vary by state and by region, with individuals living in the South and West the most likely to be uninsured. The sixteen states with the highest uninsured rates in 2015 were all in the South and West (Figure 5 and Appendix A). This variation reflects different economic conditions, state expansion status, availability of employer-based coverage, and demographics. · Over three-quarters (76%) of the remaining uninsured in 2015 have been without coverage for more than a year.16 People who have been without coverage for long periods may be particularly hard to reach in outreach and enrollment efforts. Health insurance makes a difference in whether and when people get necessary medical care, where they get their care, and ultimately, how healthy they are. Uninsured adults are far more likely than those with insurance to postpone health care or forgo it altogether. The consequences can be severe, particularly when preventable conditions or chronic diseases go undetected. 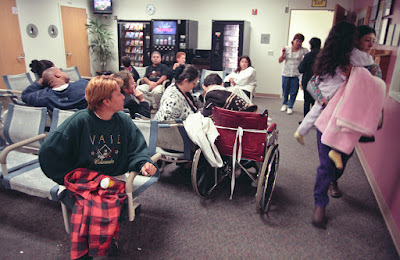 · Medical bills can put great strain on the uninsured and threaten their financial well-being. In 2015, nonelderly uninsured adults were over two and a half times as likely as those with insurance to have problems paying medical bills (53% vs. 20%).34 Uninsured adults are also more likely to face negative consequences due to medical bills, such as using up savings, having difficulty paying for necessities, borrowing money, or having medical bills sent to collection (Figure 7). While millions of people have gained coverage under the ACA provisions that went into effect in 2014, over 28 million nonelderly individuals remained uninsured in 2015. Many of these people are ineligible for ACA coverage, either because of their immigration status or because their state did not expand Medicaid. Others may be eligible but either do not know of the new coverage options, have had difficulty navigating the enrollment process, or opted not to take up coverage. Affordability of coverage, even with the availability of financial assistance, remains a barrier to insurance, with remaining uninsured adults naming cost as an ongoing major reason for not being insured. Going without coverage can have serious health consequences for the uninsured because they receive less preventive care, and delayed care often results in more serious illness requiring advanced treatment. Being uninsured also can have serious financial consequences. The ACA has provided coverage to millions of people in the United States and has the potential to reach many more. Efforts to both extend eligibility in states that have not expanded Medicaid and reach the remaining uninsured who are eligible for coverage may enroll more people in coverage and ensure that fewer individuals and families will face the health and financial consequences of not having health insurance. 2. State Health Facts. “Total Monthly Medicaid and CHIP Enrollment.” Kaiser Family Foundation, June 2016, http://kff.org/health-reform/state-indicator/total-monthly-medicaid-and-chip-enrollment/. 13. Kaiser Family Foundation analysis of the 2016 ASEC Supplement to the CPS. 16. Kaiser Family Foundation analysis of the 2015 National Health Interview Survey. 17. Jack Hadley, “Insurance Coverage, Medical Care Use, and Short-term Health Changes Following an Unintentional Injury or the Onset of a Chronic Condition.” JAMA 297, no. 10 (March 2007):1073-84. 18. Stacey McMorrow, Genevieve M. Kenney, and Dana Goin,“Determinants of Receipt of Recommended Preventive Services: Implications for the Affordable Care Act,” American Journal of Public Health 104, no. 12 (Dec 2014): 2392-9. 19. Kaiser Family Foundation analysis of the 2015 National Health Interview Survey. 20. Kaiser Family Foundation analysis of the 2015 National Health Interview Survey. 21. Jack Hadley, “Insurance Coverage, Medical Care Use, and Short-term Health Changes Following an Unintentional Injury or the Onset of a Chronic Condition,” JAMA 297, no. 10 (March 2007): 1073-84. 22. Fizan Abdullah, et al., “Analysis of 23 Million US Hospitalizations: Uninsured Children Have Higher All-Cause In-Hospital Mortality,” Journal of Public Health 32, no. 2 (June 2010): 236-44. 23. Andrew Wilper, et al., “Health Insurance and Mortality in US Adults,” American Journal of Public Health 99, no. 12 (December 2009): 2289-2295. 24. Wendy Greene, et. al., “Insurance Status is a Potent Predictor of Outcomes in Both Blunt and Penetrating Trauma.” American Journal of Surgery 199, no. 4 (April 2010): 554-7. 25. Sarah Lyon, “The Effect of Insurance Status on Mortality and Procedural Use in Critically Ill Patients,” American Journal of Critical Care Medicine 184, no. 7 (October 2011): 809-15. 28. Mark Hall, “Rethinking Safety Net Access for the Uninsured,” New England Journal of Medicine 364 (January 2011):7-9. 32. Glenn Melnick, “Fair Pricing Law Prompts Most California Hospitals to Adopt Policies to Protect Uninsured Patients from High Charges,” Health Affairs 32, no. 6 (Jun 2013); 1101-8. 35. Kaiser Family Foundation analysis of the 2015 National Health Interview Survey.